A form outcome rule evaluates data provided by a control in the form, and when the rule is true, causes the form to take a path. In this example, a drop-down list has three values: "Very Interested," "Somewhat Interested," and "Not Interested." 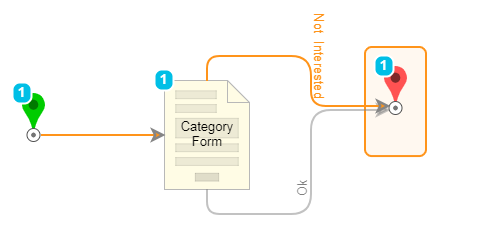 If the "Not Interested" value is selected, the form automatically exits. A rule that evaluates the user selection in the form. The rule is a logical rule that simply makes a true/false determination if a string matches the value "Not Interested." A form that contains the drop-down list, and has the outcome rule applied. A flow that contains the form. This rule is a logical rule that simply makes a true/false determination if a string matches the value "Not Interested." In a Designer Projects folder, click on Create Rule > Create Rule	. Name the rule and set its behavior to Form Rules	. Next, set the input data for the rule, which in this example, is a single text value for the user&apos;s selection from the drop-down list. 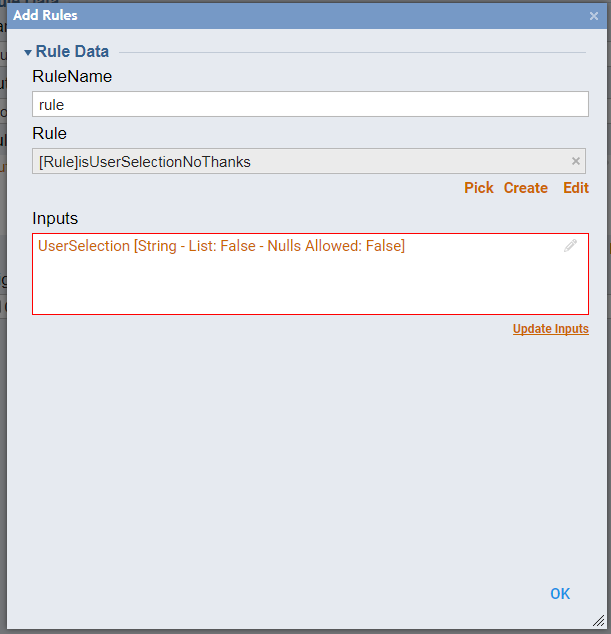 From the Start Rule	window panel, under Rule Data > Rule Input Data	, click on Show Editor	. 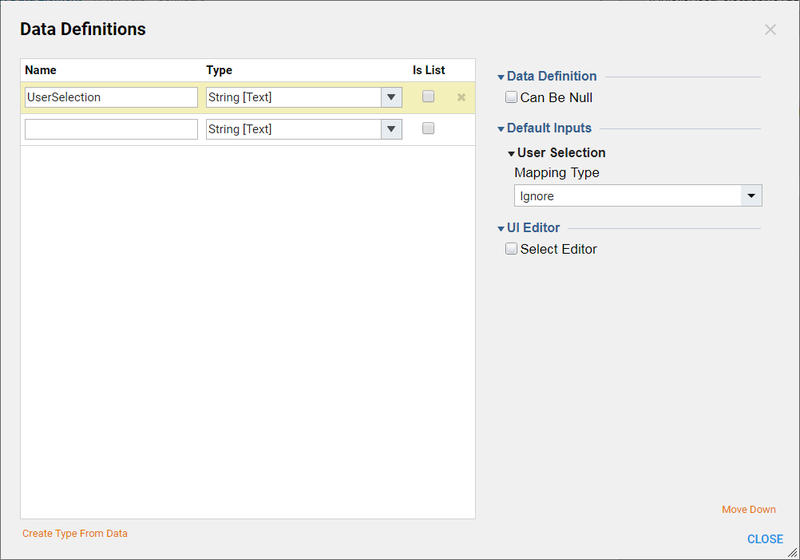 Enter "UserSelection" as the name for the input data, and set its type to string. In the Rules Designer Start Rule	window, select Add New Rule Step	button. Select UserSelection	and click Next	. Expand the Text Rules	category and click on Equals	. Click Next	. The rule configuration is complete. Save and close the rule. In a Designer Projects folder, click on Create Form > Create Form	. Name the form and click Create	. Expand the Actions	category and drag and drop a Button	component into the form. Name the button "OK."
Expand the List	category and drag and drop a Drop Down List	component into the form. 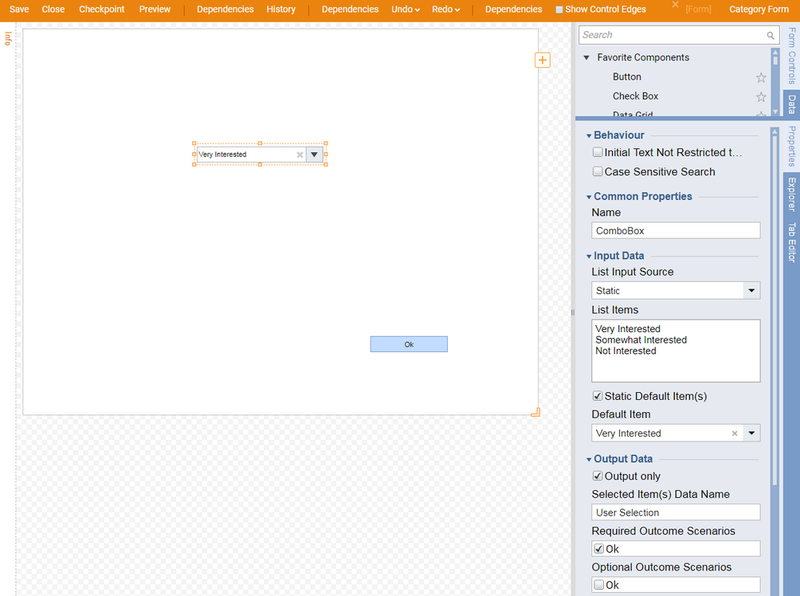 From the Properties	panel, configure the Drop Down List	component. Set the input data type to String	, and set up the list of static values: "Very Interested," "Somewhat Interested," and "Not Interested." Set the default selection to "Very Interested." Set the output data toOutput Only	, and enter the output data name "UserSelection." Check the Required Outcome Scenario	checkbox for the OK outcome so that a selection is required. The next step is to apply the rule to the form. This is done at the Surface level of the form. Click on the Explorer	tab, and click on Surface	. Click on the Properties	tab. The surface-level properties for the form appear. Scroll down to find theOutcome Rules	section. Click on Add	. 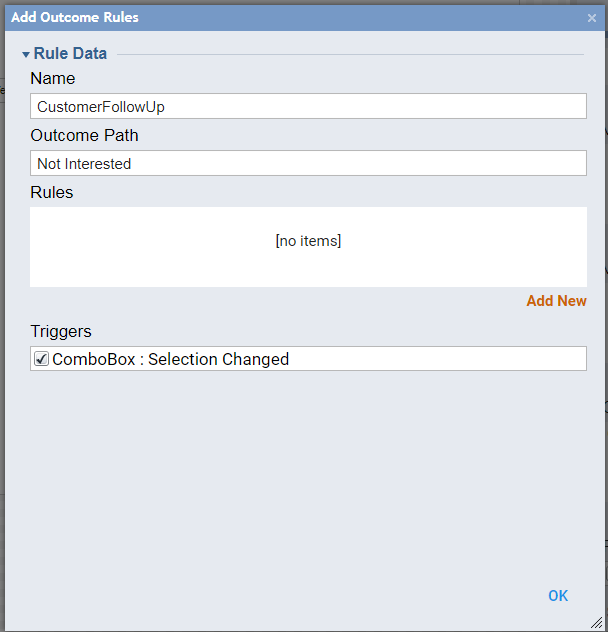 Enter the group name that represents the set of rules (this example includes only one rule), determine the name of the outcome path, and select what event will trigger the running of the rule group. Under Rule Data	, click on Add	. 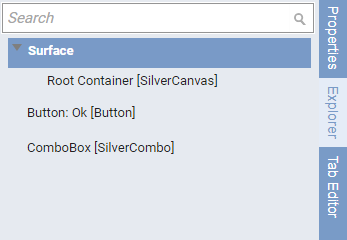 Enter a name for the rule, and click on the Rule	field Browse	button. Navigate to and select the rule. Under Inputs	, click on the UserSelection	input and click Edit	. 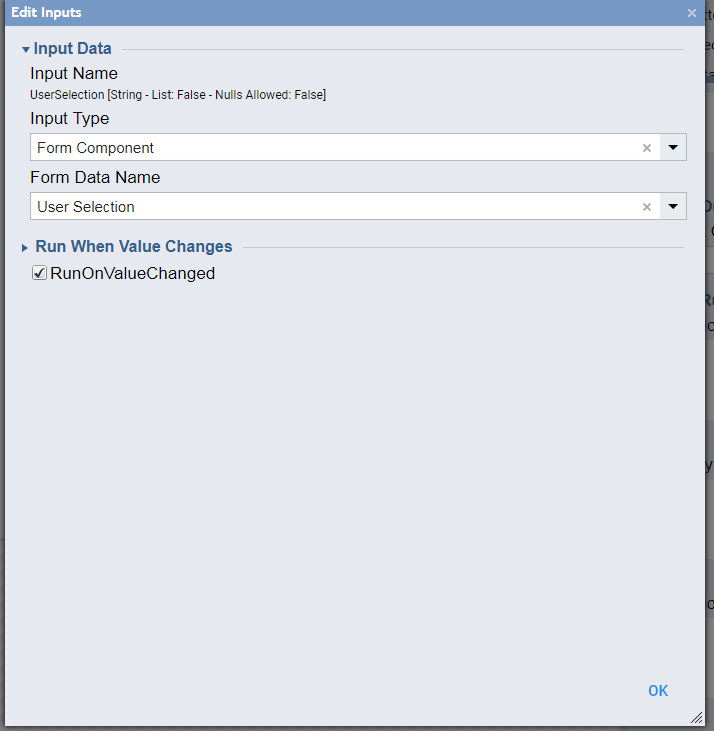 Change the InputType	field value to Form Component	, and select UserSelection	as the data from the form that is providing that input. Click OK	to close the Rule Data screen, then click OK	again to close the Rule Group screen. In a Designer Projects folder, click on Create Flow	. Name the form and click Create	. The flow will begin by the user browsing to the form just created. 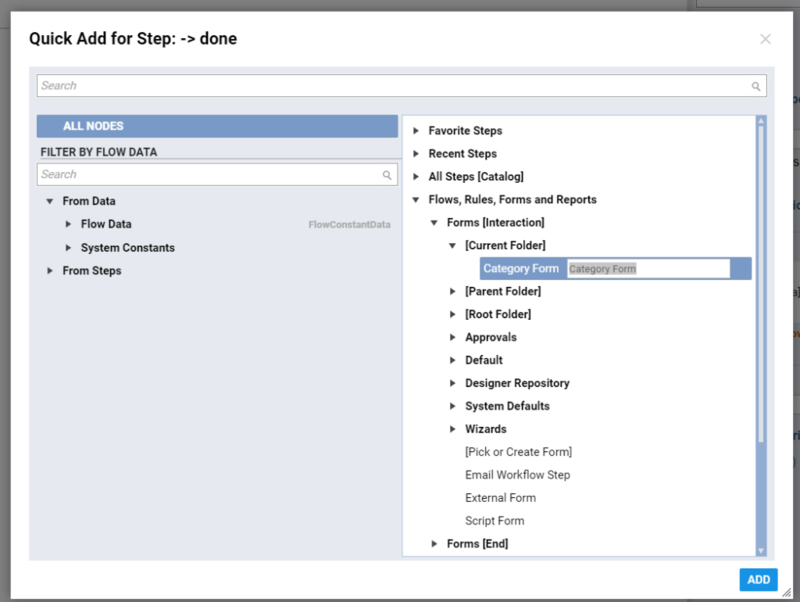 From the Flow Designer&apos;s start-up window, expand Flows, Rules, Forms and Reports >	Forms [Interaction]	, and navigate to where the form resides. Select it and click Add	to place the form into the workspace. Notice the two outcomes from the form, OK	and Not Interested	. Connect the two outcome paths to the End	step. Save and run the flow. 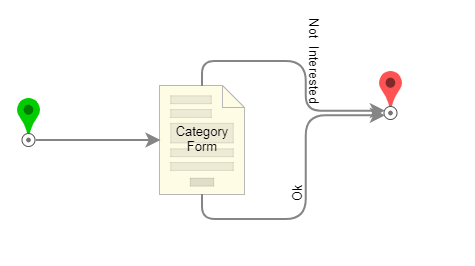 Notice when the user picks "Not Interested," the form exits on theNot Interested	path.